Is The Natural Gas Honda Civic The Only True Green Car? One of the least known Honda Civic alternative fuel vehicles is the Compressed Natural Gas(CNG) vehicle. Environmentalists are all smiling about their hybrids and how much less fuel they use and how eco-friendly they all are for using electricity instead of gas. Well, the CNG Honda Civic is a hundred times more environmentally friendly on its worst day. Why? The plants that produce the electricity used in a hybrid must burn oil, coal, or use a nuclear reaction to provide it. CNG comes from the ground and is easier to drill for than oil, so does not impact the Earth as much during extraction. A CNG vehicle’s carbon footprints is the size of an ant’s next to a hybrid’s. The Civic Natural Gas vehicle is the cleanest-running internal combustion engine ever certified by the Environmental Protection Agency. What about fuel economy you may ask. 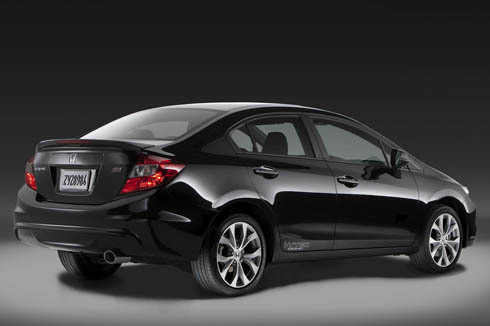 How about a Honda Civic that offers 38 mpg and 240 miles between fill ups? Not bad at all. Then there is the time it takes to refuel. Minutes for a CNG Civic. How many hours for your plug-in hybrid or EV? Hours, isn’t it? Now the other shoe falls. There is a decided lack of infrastructure for the CNG Civic. Refueling stations are rare, even more rare than commercial recharge stations for electric vehicles. A CNG refueling point costs more to install than a traditional gas station, as well. The federal government is considering offering companies incentives and funds to develop CNG infrastructure. The end goal of some investors is to see CNG points next to traditional gas pumps, just like diesel is today. The Honda Civic CNG was introduced in 1998. Honda has sold few vehicles to the general public, but has enjoyed limited success with municipal fleets. The car was awarded the 2012 Green Car of the Year Award. Hopefully, the added attention will hep to bring the vehicle more into the mainstream. *** They say they only deal with customers in WIsconsin, IL, and Indiana, but that not true. Get a Great Deal from them. Tell them Tom Rosen sent You there. Hi Ya, just a quick message to say that I’ve added your blog to what I think to be the best Honda blogs on the whole web. You can see the list and your link here – hope you like it! I also had a quick question that I wanted to ask you so hope you can email me back. I wish vehicles like this got more traction in the market. From what you’ve said its the most environmentally friendly on the market. Are there any downsides to these CNG vehicles that might be stopping them from getting any real market power? Honda is one of the worst car companies out there. The Civic is just a cheap car that has about as much horsepower as a moped (that’s insulting to mopeds everywhere).